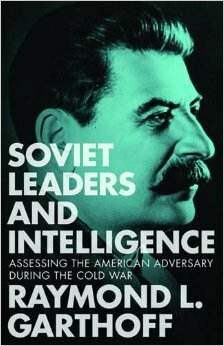 Veteran journalist and author Joseph C. Goulden offers a good review in the Washington Times of Raymond L. Garthoff's Soviet Leaders and Intelligence: Assessing the American Adversary During the Cold War. As any observer of the old Soviet Union realized, espionage and related activities occupied a prominent role in the Communist nation from its very founding. Several generations of writers — both fiction and nonfiction — have prospered with accounts of spy rings, ranging from the Philby cabal to the Red Orchestra. But what use did Soviet leaders make of the massive amounts of material that flowed into Moscow? Several prominent examples exist of ignored intelligence, notably the multiple reports that reached Joseph Stalin about the imminent Nazi invasion in 1941. Rather than heed the warnings, Stalin scrawled obscenities on the reports and cast them aside. Now comes Raymond Garthoff with a scathing indictment not only of the Soviet intelligence services, but the use made by the leadership of the information they gathered. The KGB (and its siblings) violated a basic tenet of the intelligence profession: Beginning in the Stalin era, and continuing to the end of the Cold War, the spies told their bosses what they wanted to hear, rather than the truth. Mr. Garthoff is uniquely qualified for such a study. He became a “Soviet-watcher” during his academic years and worked for the CIA and the Rand Corp. before becoming a foreign service officer. In retirement, he served at the Brookings Institution. Much of his book is based on personal conversations with Soviet officials — including intelligence officers who spoke candidly about their own service — and declassified Soviet documents.